The Dell Wyse D90D7 is a high-performance Windows Embedded Standard 7 thin client for virtual desktop environments. Featuring a dual-core AMD processor, the D90D7 achieves outstanding speed and power for the most demanding VDI and embedded Windows applications, rich graphics and HD video. Take a unit from box to productivity in minutes. Just select the desired configuration and the D90D7 does the rest automatically—no need to reboot. And with Microsoft Windows Embedded Device Manager connectivity, you can leverage your existing Microsoft System Center Configuration Manager platform. The D90D7 is an ideal thin client for demanding virtual desktop or cloud applications. Questions about the Dell Wyse D90D7 Thin Client? We can help. For more information about the Dell Wyse D90D7 Thin Client, or any of our products and services, call us at 1.800.457.8499 or email us. 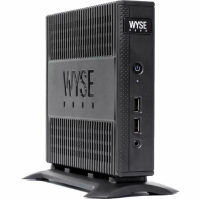 Order your Dell Wyse D90D7 Thin Client today. Order your Dell Wyse D90D7 Thin Client now. Your purchase order, with credit approval, is welcome, as well as all major credit cards, PayPal and Google Checkout. Remember, you'll get FREE technical service with every product you buy from Vecmar.